I like to experience as much as different combinations of t-shirt and pants/jeans combo. Skinny jeans are a torture in summer time so my goal is to find comfy alternatives to them. Non-denim pants are great options in that sense (as I’ve talked about this many many times before) The one I’m wearing today is creating some sort of an illusion in the photos but it doesn’t in reality. 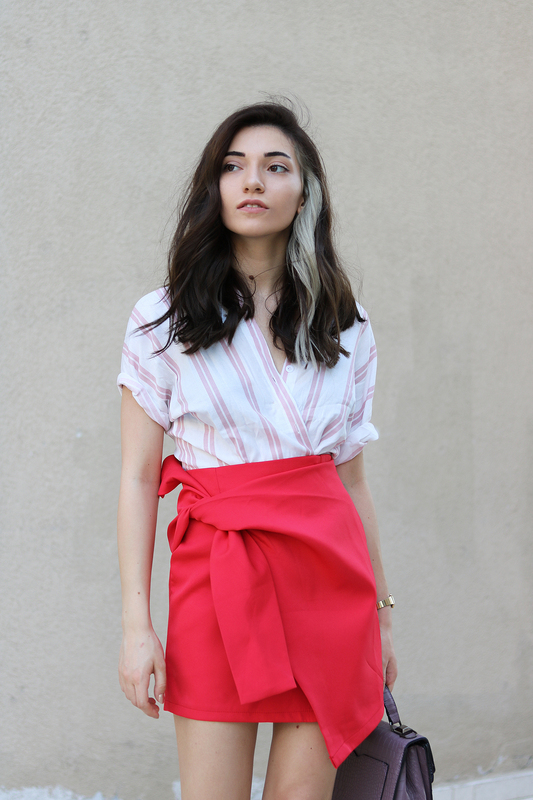 So I benefit the power of vertical striped to look slimmer and taller, win win. Other than looking more flattering than usual skinnies, the pattern adds so much to the outfit. I also would prefer to wear white pants with this t-shirt and it’d create a very powerful look. However instead of a monochrome outfit I love the fun vibes this combination spreads. It even kinda looks like popcorn with striped bottom and ruffle details on top. I’m still obsessed with skirts and this is the most wise decision I’ve done this season since summer feels more and more hot. It’s impossible to wear skinny jeans in these days so skirts and non-denim trousers are great options. This photos are taken few weeks ago that’s why my hair looks different from now -for information purposes- I still love my new hairstyle tho and the funny part is I’ve mentioned that I wanna dye lef part of my hair pastel pink however it seems like impossible. The first attempt was not successful in terms of percentage of dyes and this time we used the wrong one. Anyway it’s all okay and I’m happy with it. I’ve already told you that my favorite color is red this summer. The funny part is before last few months I did not have anything in red, seriously anything. And now I thing it is a great way to liven up your closet. 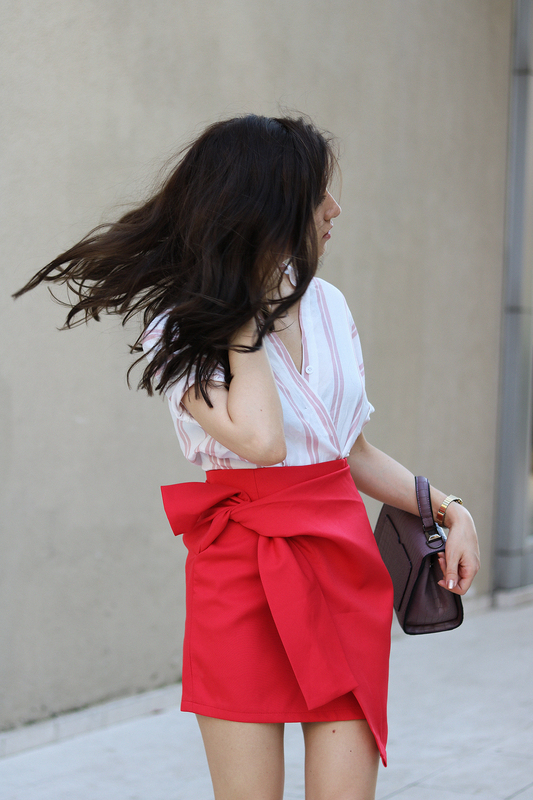 I also love pink and red combo trend and I thought this skirt is just the perfect thing to pair with a pink top. Although I’m likely to wear the skirt with a basic t-shirt I wanted to add more characteristic to the whole look so I wrapped around it. You may already know that I’m not into skirts but this have changed this year. 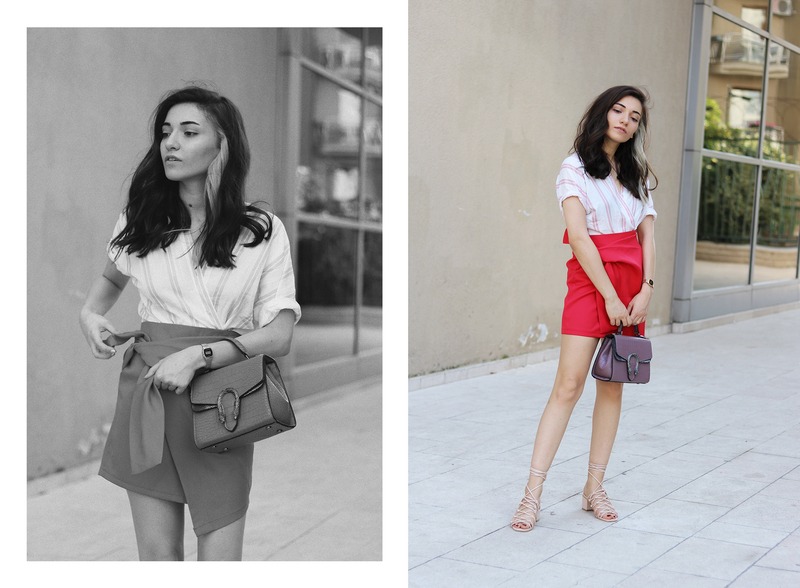 There are so many amazing skirt styles this season and I despiretely want to try all of them. I think this one in particular is THE best skirt I’ve ever own, I love love love the tie detail so so much and the fit and the material is just perfect. It is definitely a statement piece that I can wear with my basic round neck white t-shirts or colored shirts for fun. Also, there are some other changes on me apart from the skirt, I have NEW hair! It got shorter, darker and a piece of grey. This lengt is usually my favorite for years but I always fail to go and have it cut so here we go now. 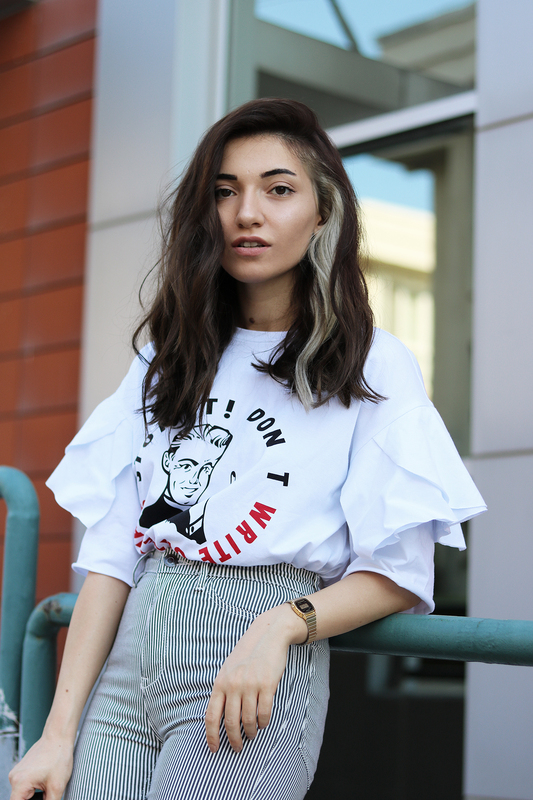 If you are here for a long time then you know I used to have blonde hair for a while and I’m more than happy to have dark brown again and I wanted to have some fun by adding an almost white piece to play with colors. It’s grey right now but I wanna dye it pastel pink as soon as possible, we’ll see what will happen. I also would like to achieve to create different hairstyles (basically that’s me every summer) as well as different outfits. So fingers crossed! 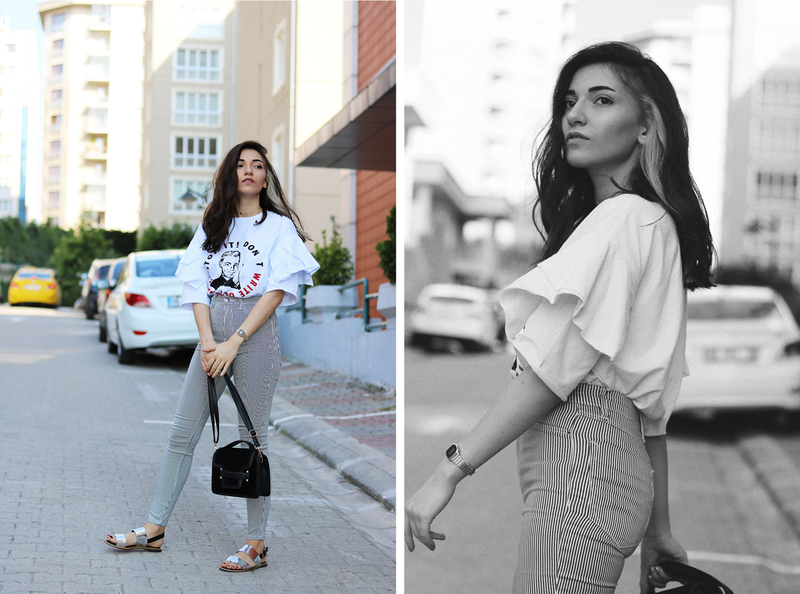 A t-shirt and jeans my go to outfit in summer and I like to create some different versions of that combo. On the other hand I do love wearing jeans in particular and my goal is to try as much as different styles I can and have fun with them. 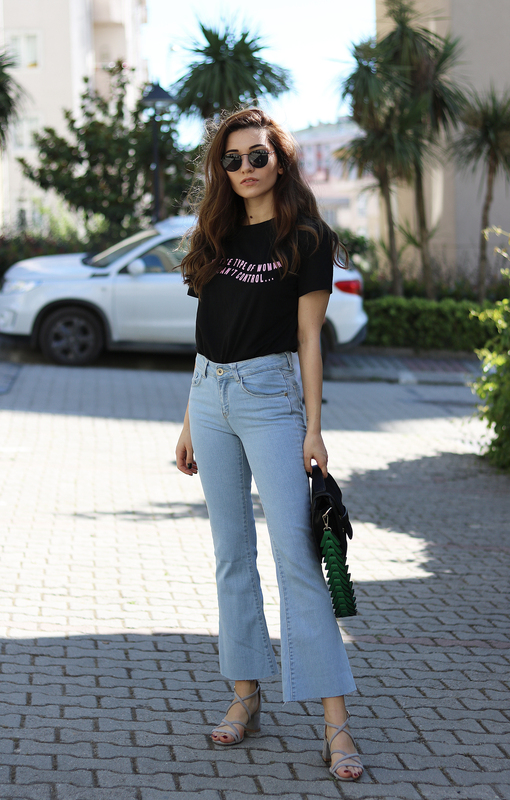 Flare and straight legs are my favorites this season. 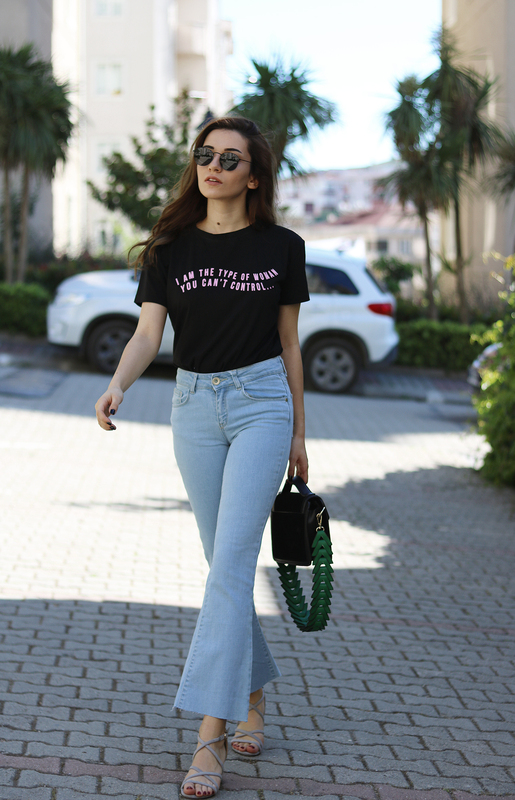 When I found this flare jeans on sale I knew that I’m going to purchase and cut them off. They fit perfectly and that’s a pretty rare situation for me, I can not wear even XS or waist 26 from most the the brands, I’m okay with leg fit but not just the waist. So it was pretty emotional to cut these incredible jeans but I loved how they turned out. Practically it makes me look shorter BUT it is one of my favorite pairs already. On the other hand I’m proud of my feminist t-shirt collection. It says “I’m the type of woman you can’t control…” and it’s great message for who wants to have control on women. I stand up for women being independent and making their own decisions. 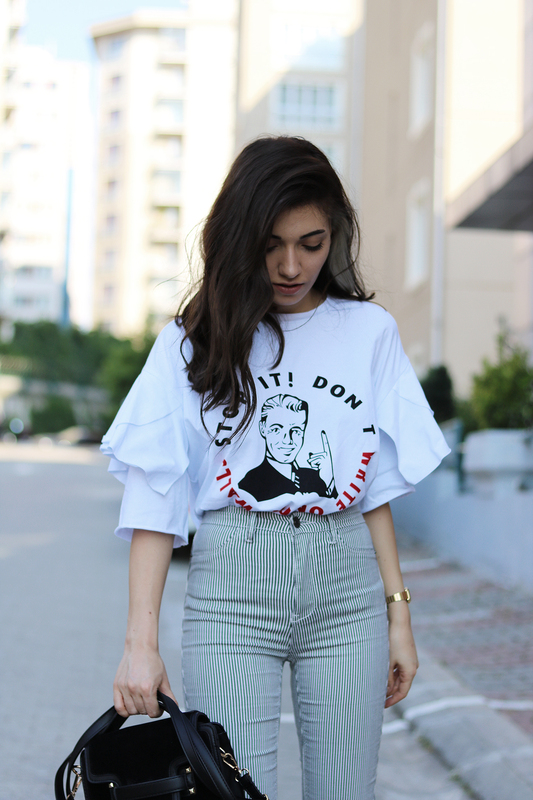 So this t-shirt fits perfectly with my opinions and as you can imagine I felt like I’ve found a trouser when I saw it. Unfortunately it’s out of stock so I linked a very similar one.